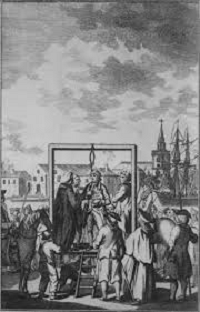 To mark Halloween, I am posting the following tale of dastardly deeds on the Isle of Dogs in the 18th century when it was largely uninhabited and had quite a sombre reputation due to the hanging of pirates in gibbets at certain locations on the Island. 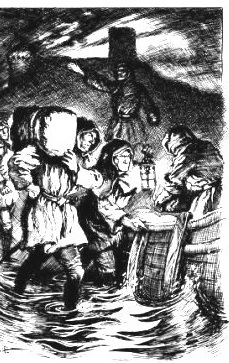 The story was written by Edwin F. Roberts, in a little publication, entitled ‘Christmas stories round the sea-coal fire’ in the 1840s. The narrator is an old sea-captain who likes to ‘spin a yarn’ sitting in his chair at the Ferry House Tavern which still survives , being one of the oldest surviving buildings on the Island. Once upon a time, and many a generation ago, there used to be a good deal of contraband going on in this quarter. Schnaps and laces, Dutch waters and Nantz brandy and the like, were landed in the creeks, of which there were plenty, and what with the shallows which required good pilotage to avoid, and the boggy treacherous surface of the soil, which could only be traversed by those well acquainted with its nature, and what with the known desperate character of baggy-breeched Hollanders, the crews of light French luggers, and the boat men, or rather river-pirates of the district, a roaring trade — despite the daring and vigilance of the revenue officers — continued and throve. Nothing could be better adapted for landing keg and bale than the hundred hiding places offered by clumps of pollards, willows, poplars, and the dense brushwood that covered the opening of the numerous holes and small estuaries formed by the tidal waters, the ditches, and streams of the marshes. Dark nights easily favoured any light skiff or wherry that might have, taken in cargo miles below, and ‘ Bugsby’s Hole’ was a place for a length of time especially favoured by these visitors, till the occurrence I am about to relate drew attention to it, and forced the lawless adventurer to find out other outlets. As a matter of course the inhabitants of the neighbourhood favoured these proceedings, and when night had fallen, groups like phantoms, might be seen stealing across the dusky flats, defying-if not detection— at least all chances of present capture. In this very house— the old Ferry-House— as it was then called, many a jovial rouse has been held, and drowsy, drinking songs from Scheldt, love-lays of Normandy, and roaring English ballads trolled out, over as many a can and cup. You see it was no uncommon thing for a numerous but somewhat rough company to meet here at nightfall and hold revel. Broad and bulky Dutchmen, jabbering, lively fellows from Havre and Dieppe, might have had a little business, either over or to begin, three or four lads in for a spree, might come ashore by boat from some craft in the river, and the house itself being so lonely and isolated on this particular side, where there was neither road nor traffic, save in the day time, for passengers, cattle, and the like, making for the opposite ferry— besides not having the very best of good names in the world— all this would bring a wild and motley assemblage together. Mercy on me what I have heard tell of these rouses they used to have. 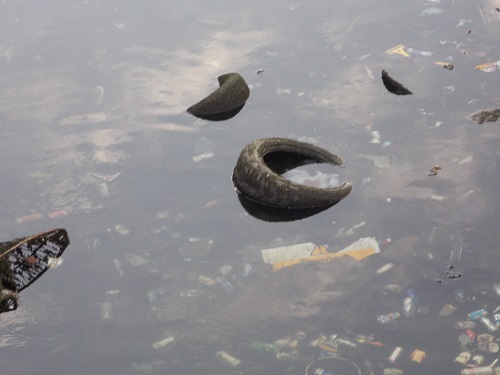 Half a puncheon, no less, for a bowl as would swamp the largest wherry on the water, and as there was many a can that never paid— but never mind, we’ll take that for granted. It isn’t all the likker that’s drunk, nor the baccy that’s smoked, that pays what they ought to pay, mind that. Well they used to carry on tremen-jous, that they must, if only half be true what’s told, and if, as often happened, a bit of a rumpus, a sort of brotherly pitching-in to one another affair took place, why, nobody but themselves was the wiser, for they could keep it without any interference of any kind, for the deuce a one was there to stop ’em. You may guess what a lawless, jolly, uproarious sort of night one might have spent here. If that had been the worst, however, perhaps, no great harm was done, but the knife was used as often as the fist — for them foreign chaps have them out in a crack — and when the blood is up and blazin, why out in course it must come, yours or mine. Now about the fiddler. It so happened one beautiful bleak night— a regular night for business, with neither moon nor stars aloft for to use as the song says, a lot of rough-looking, brown-faced, bushy-whiskered fellows, speaking every tongue, Dutch, French, Spanish, Lingua franca, and a few tough, bulldog English, were met to have a rouse at this old house , and by the lights blazing at one time in every window, you might have fancied it was in a conflagration. Business rather than pleasure, however, seemed to have called them there together this night, for the shutters were soon closed and the last boat crossing the ferry had now come in, and brought half-a-dozen lasses and their jolly young watermen, to meet half a dozen others, and their sailor chaps, and with them in the bargain, lame little Peter Cremona, the fiddler of the whole district for a whole generation past. The bushy-whiskered boys looked glum and lowering enough at this, as thinking that there were a few too many among them. The moment Peter, however, made his appearance in the tavern, those who knew him greeted him with a jovial and hearty welcome. ‘ Peter, (so the story goes,) was liked by everybody. He was a kind-hearted, chirping, contented little body, and would play for the children by the hour together, without expecting a groat and a fiddler you see, is always welcome to a sailor as to a landsman if he’s merry. In fact, Peter topped all his good qualities by playing the fiddle like an angel and therefore, Peter’s presence was the signal for clearing the decks, or rather the floors, at once. 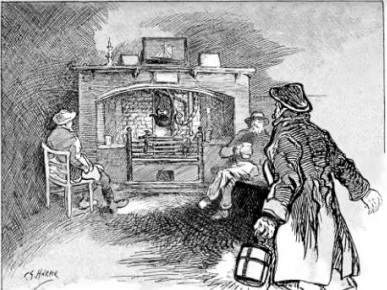 All this time the foreigners were looking as black as a thunder cloud, but did not think it necessary to take any exceptions , so they sat in a group on one side of the fireplace, smoking and drinking, and talking in under tones among themselves. As they either were not known or only guessed at, nobody interfered with them, and the fun for a time went on. Peter after having been crammed with meat and drink, was lifted, up to his usual chair of honour, and the fiddle set to work in style, in fact the old boy was in his glory and looked it. Presently the dust flew about, the timber creaked, and the house, rather substantially built to, reeled under the vigorous footing of the hornpipe and double shuffle, while the dancers on the floor, when they grew tired, were as instantly replaced by others. But the night grew late, and the landlord knew there was a time for everything. The grog was ladled out , little Peter dead beat, found his pockets heavier with coppers and silver bits than they had lately been. Even the poor doggie was not forgotten — sailors love dogs you know — and Tray was fed and petted to an extent that might have spoiled his nature only that, he was a sensible, sharp-eyed, keenish chap of a terrier— and so he knew that there was soon an end to every favour, and bore all as philosophically as the purser does his abuse on payday, or as he used to do. So as it grew late, and the landlord had given his guests a broad hint, they very reluctantly began to separate, some across to Deptford and Greenwich., some to their vessels in the river, some to their homes at Limeh0use or Poplar, until at last only poor Peter, half nodding over his pipe by the fire, with poor Tray between his feet, and the bushy whiskered fellows, were left, until they, at last, went too and Peter who was to attend a wedding at Stratford le Bow in the morning, and had to cross the melancholy tract stretching far away ; but which from long habit he knew well, was left alone — alone with his poor old dog. Peter was enjoying his last glass and his last pipe with the greater relish, that he knew he must soon start and breast the keen bitter north easter, that was moaning and wailing over the flats and as the landlord now joined him and proposed a glass extra for their two selves, the warm pleasant fireside was more difficult to leave , but Peter who was married, for all his wandering life, and consequently henpecked, had no choice, sooner or later he must make his way, and the sooner the quicker said Peter, though every moment’s delay made the night later, and it was by no means pleasant to turn out. The night continued to be very dark, one of first-rate value for the bushy-whiskered chaps that had last made sail, and the wind was heard coming in fitful moaning gusts, accompanied now and then by a sharp rush of rain. His way lay across the eastern end of the island, where a rude bridge stretched across the Limehouse gut, and communicated with the Middlesex shore, in the vicinity of the Lea, from whence the road was plain and practicable enough, though the worst of it now lay before him. Having given a last tune to the lasses at the old ferry, bagged his fiddle, emptied his glass, and roused up Tray who seemed very much to enjoy his present lodgings, Peter finally set forth, tolerably well primed, but by no means shaky, his head being too well seasoned to leave; a single sheet even fluttering in the wind. His queer old-fashioned coat was buttoned up to his ‘ nose, and his old cocked hat lashed down with a lanyard under his chin and with Tray feebly wagging his funny worn out tail, he was soon lost in the darkness. Above, all was of a murky hue, while a thin line of semi-lurid light on the edge of the horizon, broke by ragged trees and other obstructions served as a sort of landmark for the belated fiddler and as the wind come moaning and shrieking over the long level flats which seemed now and then to yield to his feet, chirping merrily to himself, he trudged on beside a deep ditch, or rather water course, till he had almost attained the worm-eaten bridge which was flung across beside Bugsby’s Hole, when the flashing of a torch some distance below, drew his attention, and deviating from his road through a more perilous and boggy portion of the marsh, he came under the shadow of a small headland which, aided by a clump of pollards, formed a capitally screened hiding place. Peeping down from this, he beheld a large flat-bottomed boat drawn up, half-filled with kegs, partially covered with a huge tarpaulin, and the bushy whiskered fellows, in their great boots, fishing jackets, and Kilmarnock caps, busy in passing the tubs and packages from one to another till they reached some carts on the opposite shore, which just at this moment, being well loaded, were silently driven away. Perfectly up to the work that was going on, and feeling that he had no right to interfere, even if he had the inclination, he was on the point of turning quietly away, when the poor dog, who dreamed of no harm, wandered in the midst of the truculent villains, and thus betrayed him. With many an outlandish oath, the unfortunate fiddler was dragged away, and after that night became — lost — he was never after seen alive. The merry harmless old man who was so universal a favourite with all, was missing, and in a few days the whole district was in a ferment about his absence. Days went by and at a part of the island not often frequented, some people passing remarked that they beheld on a certain spot, a poor half-famished dog, whining and shivering, which was recognised as having belonged to the lost fiddler. The spot in question was on the edge of a deep black ditch, over which a hideous and ragged old willow tree spread its ghastly arms. No persuasion could get the dog away, but when any one approached he would set up a long melancholy howl and even after he was captured by a good-natured fellow who took him home, and fed him, the next day he had escaped and was found uttering his long sad, sorrowful wail on the very same spot beneath the very same willow, on the verge of the dismal ditch ; and this at the last, coupled with Peter’s unexplained absence, began lo awaken suspicion in the slow brains of the people in the neighbourhood. 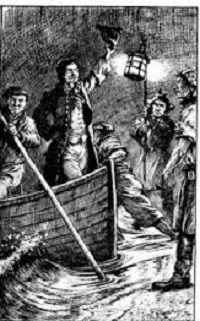 This awakened suspicion, and at last several men examined the place, and out of the foul ditch the body of the ‘ Lost Fiddler,’in a very shocking condition, was carried to the Ferry House, where on examination and a coroners inquest, a fractured skull and a deep stab with a knife, told the dark story. The body happened to be laid in this here room It strangely happened also, that some of the bushy whiskered fellows visited the house that day, and were observed to turn pale, to look agitated, hurried, and anxious to depart when they heard that the corpse of the poor fiddler was in the next chamber to them. They were going forth, and passing by that door to the head of the stairs, which was partially open, when in an instant, the miserable, worn out, half famished dog, who would never leave his master, rushed forth and seized hold upon one man with the ferocity of madness. The wretch shook and beat him off with curses and cries of horror, but Tray was on him again like a small tiger. The man drew his knife and stabbed at him, but the dog persisted in the attack, filling the house with yells and deep snorting barks, mingled with the man’s cries. The latter at last slipped in a pool of the bravo brute’s blood, and the terrier now fastened on to his throat, and in a perfect frenzy of terror and helplessness the assassin confessed his guilt, and was in due time properly hung at Execution Dock for more misdeeds than one. The dog who had thus avenged his master lay dead of a dozen wounds. So you see it was not because the king once kept his hounds on the island that this was called the Isle of Dogs, but because a poor fiddler’s dumb brute, who was faithful until death, associated himself with this identical spot. And now my yarn’s over, and the bowl is empty. What is interesting about this story is that it is a version of a similar story that had been known for at least a century before. Charles Dickens refers to the story when he visits the Island in the 1850s and notes that it is mentioned by Strype the historian in 1720. Although it is doubtful the story is the reason the Island is called the Isle of Dogs , the fact the story survived for such a long time might indicate that it might be based on some incident in the dim and distant past. 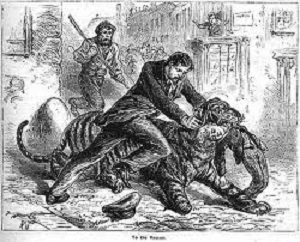 Whilst doing a little research about the Regent’s Canal, I came across the following story which is relatively unknown compared the Jamrach and the Tiger incident illustrated above that happened in 1857 on Ratcliffe Highway. Well before Jamrach set up his emporium, George Wombwell was the undisputed King of the Menageries and he had a base in Commercial Road near to the Regent’s Canal. From there he travelled all over the country to the many fairs to exhibit his wild animals, however he also used his base in Commercial Road to buy animals bought from all over the world by sailors who berthed in the local docks. He would then sell the animals on to Zoo’s and other interested parties. The following newspaper report is from 1839 and is interesting for more than one reason, the local characters such as Mr Thomas and the Irish Coal Whipper are particularly entertaining. Escape of a large Bengal tiger from Wombwell’s menagerie at Limehouse, near the Regent’s-canal Dock-bridge. It appeared that the animal broke loose from its den about half-past seven o’clock, and found its way into the Commercial-road, where it was first seen leisurely walking along by Mr Thomas, a boot and shoe-maker in Ratcliffe Highway. He first observed the animal near the White Horse-gate. and, supposing it to be a bear, called out to a female who was near him, ” Stand back. here is a bear coming ” The young woman immediately threw off her pattens, and ran away down an adjoining street leading towards Shadwell, and was not seen again. Directly afterwards the tiger passed Mr Thomas who had sought refuge in a doorway. After the tiger had passed him. Mr Thomas, lost no time in communicating the circumstance to all the policemen in the vicinity, who proceeded in various directions, and warned the passengers of the locality of the dangerous beast. The tiger in the meantime continued his course along the Commercial-road, the people flying in great terror on his approach, until he met a large mastiff dog, which he instantly attacked, striking the dog on the back with his paw and crushing him with a single blow, and seizing the poor animal with his teeth threw him into the air. The dog fell lifeless on the ground, and the tiger then continued to amuse himself with the carcase for some time, running up and down the road with it until he reached a house near the bridge. The gate of the garden having been left open, he entered with his prey and laid down to devour it. The only person at-home was a servant girl, the family being absent at church. Hearing a noise in the garden she took a light, and went to the door to ascertain the cause. upon opening the door several policemen called out to ‘her to close it directly, and keep within the house: and it was fortunate she did so, for at that moment the tiger, attracted by, the light, was about to spring upon her. The tiger remained in the garden for some time, busily engaged in devouring the dog, until a policeman, more bold than the rest, advanced towards the spot, and closed the gate upon it. A stout rope was immediately procured, and a slip noose having been made It was thrown across the animal, which made a sudden spring towards the railing, about six feet in height, separating the garden from the foot path. In doing so, the noose fastened itself round it, and the tiger remained with its head towards the ground, and loins on the rails for some time, roaring tremendously and alarming the whole neighbourhood. The mob, which had kept at a respectful distance while the animal was at liberty, now advanced; but although the beast was under some restraint, it struggled violently, and made use of its fore paws. One man, an Irish coal whipper, who got too near, had his cheek torn open and his belly severely lacerated. So great was the curiosity of the populace, that the police had great difficulty in keeping them beyond the reach of danger! and some fool hardy, half-drunken ballast-getters and coal whippers were with some difficulty, restrained from making an attack upon the tiger. 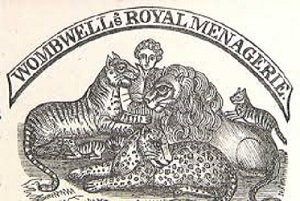 The keepers of Wombwell’s menagerie were soon apprised by the police, and brought ropes, which they fastened round the tiger’s neck, and after a good deal of resistance led him back to his den. One of the keepers was severely injured while securing the animal, which tore his hand, and put him in great pain. It was some time before the neighbourhood recovered from the alarm which this event occasioned. It appears that the door of the tiger’s den had been incautiously left open, and it broke a chain by which it was secured to the side of the cage or caravan, and got out. The aftermath of the drama was Mr Wombwell was bought in front of the local magistrates who had been told there had been other occasions when an animal had escaped. Apparently a Polar Bear had escaped a few months previously which had nearly killed a passer-by. Mr Wombwell’s defence was that all the animals had been trained to appear on the stage and were docile, he claimed it was the dog that had frightened the tiger and led to the incident. Amazingly he got off with the recommendation that he should make sure there was no reoccurrence. But even if Mr Wombwell kept his promise, the people of Limehouse , Shadwell and Wapping were not safe from attacks from wild animals. In 1857, a large tiger escaped from Jamrach’s menagerie and attacked a young boy, Jamrach himself wrestled with the tiger and eventually rescued the boy. 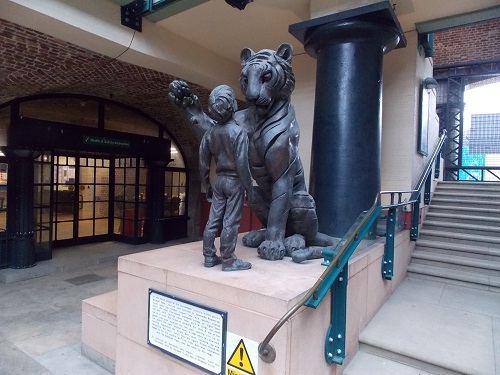 To celebrate this event, there is a statue now in Tobacco Dock that show the incident between the tiger and the little boy. Jamrach’s and Wombwell’s were not the only menageries on Commercial Road or in the area, thankfully by the twentieth century these type of establishments were dying out and people could walk down the road without the possibility of facing a tiger or a polar bear. 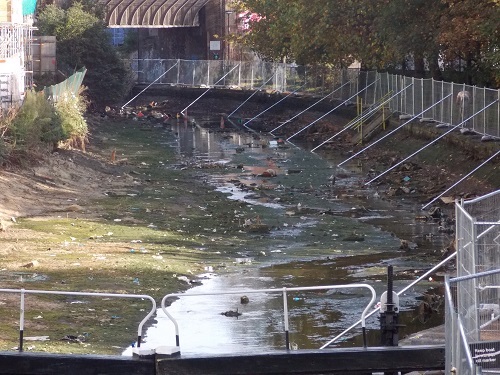 It is not often a section of a canal makes the news, but that was the case last week when a section of the Regent’s Canal was drained for repairs. The section between Johnson Lock and Limehouse Basin was drained to allow specialist brick-layers to repair damage in the canal wall. The water from this section was released by opening Commercial Lock and slowly allowing the 7.5 million gallons of water to drain out. Hundreds of fish, including a massive 3ft-long carp weighing 25 pounds, were rescued and moved to safety. It is easy to forget that the building of the canals were the ‘Crossrail’ of their day involving a massive amount of labour and expense. 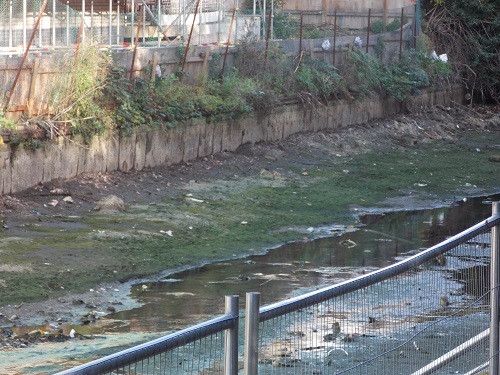 The Regent’s Canal was began in 1812 in Paddington and the last section finished at Regent’s Canal Dock in 1820. When completed it allowed cargo to be transferred directly onto and from sea-going ships. 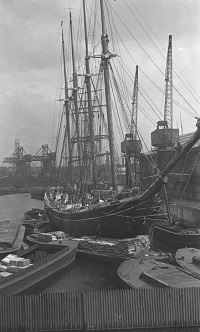 The pictures from A G Linney show this process in action, with schooners and other ships using lighters to transfer goods. It was estimated the tonnage carried on the canal rose from 8999 tons in 1931 to 168,638 tons in 1941. 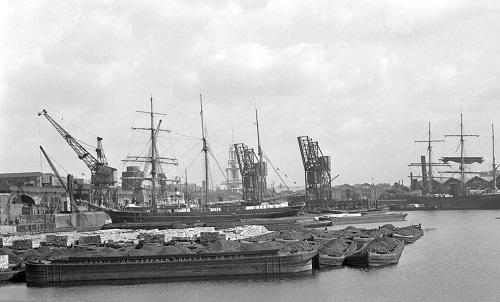 However by the 1960s there were very few commercial vessels and when the Regent’s Canal Dock was closed to shipping in 1969, it was the end of an era. The work is part of the Canal & River Trust’s multi million pound maintenance programme and shows some of the work the Trust does in caring for 2,000 mile network of historic waterways. After the canal has been made safe, there is talk of some open days in which the general public may be allowed to see some of the work close up. 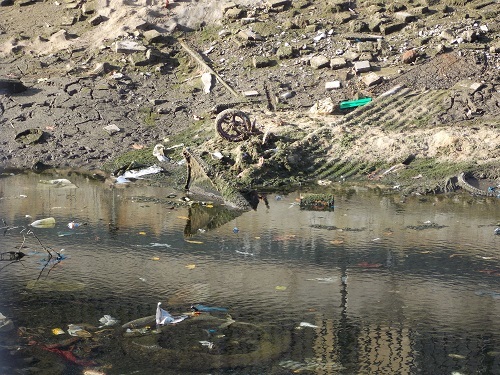 Looking at some of the debris found at the bottom it seems a haven for shopping trolleys and tyres for some reason. With all the major redevelopment around the area it seems a shame that this section of the canal is not used more, it is an important part of London’s industrial heritage and deserves to be more widely regarded. If you would like to see what an empty canal looks like, the Works are already underway and the area will remain empty for ten weeks. 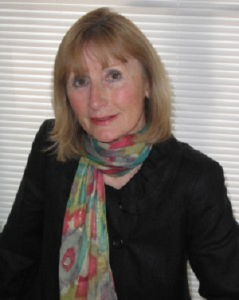 Some months ago, the blog featured an interview with Carol Rivers, the best selling author who usually locates her stories on the Isle of Dogs. Her books are usually based in the first half of the twentieth century and have been widely praised for their historical accuracy and gritty realism. 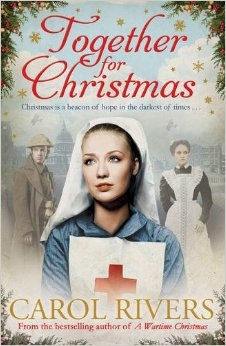 Carol has just released her latest book ‘Together for Christmas’ which follows the destinies of three friends faced with realities of the first world war. Although the book is fiction, it was the experiences of Carol’s Grandfather in the Great War that have been influential in her writing career. How influential is explained by Carol herself who contributed the following piece. A saying that perhaps the troops often used to console themselves as they struggled for survival in the deploring conditions of the mud caked, flooded and rat infested trenches of the Great War, 1914-1918. Shell-shock, trench fever, dysentery, gangrene, hypothermia and dozens more diseases were their daily companions. As a small child, my Granddad, a volunteer veteran from Chapel House Street on the Isle of Dogs where we lived in East London, told me of his experience tied to a gun wheel. Disorientated by the ear-splitting shelling, he was accused of being a deserter. He wasn’t executed but flogged and sent to a field hospital as, close to death, he slipped into delirium. It was during this time that he woke to the sight of a soldier gazing in through the hospital window. Granddad knew this man had died and was passing over his strength in those few seconds of intimacy. Granddad recovered. But mentally he was scarred and rarely talked of his ‘angel’ for fear of being ridiculed. So sharing his other-worldly moment with a child, was a gift to us both for it released his secret shame and triggered the inner life of my creativity. Unaware of all this at the time, I remember asking him what the man looked like. Granddad replied that his ‘angel’ wore the mask of every soldier dying on the battlefield. This is a vision that has never left me. The vision is where my own story began. My home and my heart are my books, telling the stories that perhaps might not have been told, had Granddad not confided in me. 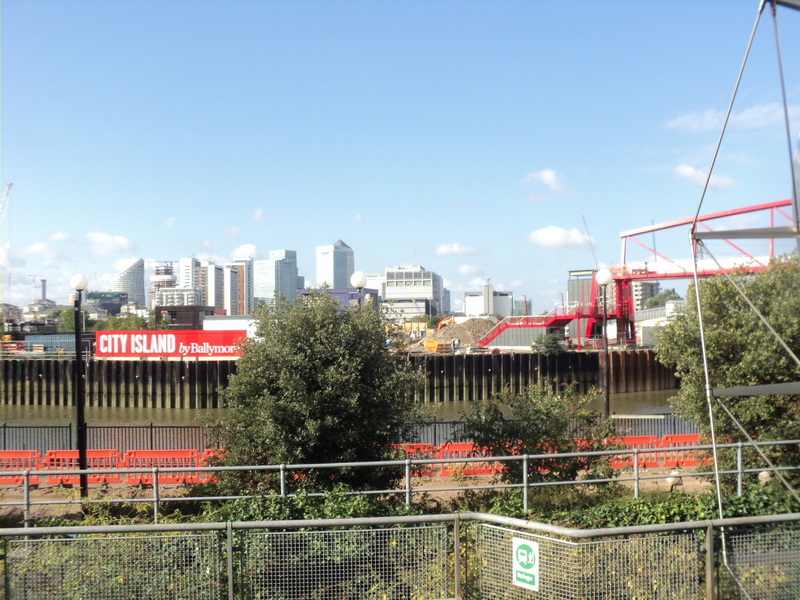 I am returned every day to the Isle of Dogs as it was in the first half of the 20th century. I write ‘ghosts’ who are living, breathing and fiercely alive. The Island has never meant more to me than it does now in this Centenary year, when I am able to honour The Fallen with my book, TOGETHER FOR CHRISTMAS. And rightly so, as many of us now would not be here today, if it wasn’t for them. August 1914, London. Britain has just declared war on Germany, and the whole country holds its breath. Flora, Hilda and Will, who grew up together in St Boniface Orphanage sit in the sunshine in Hyde Park on a rare day off, discussing the impending war and the changes it might bring to their lives. Will means to go off to fight, Hilda hopes to better her current lot in life as a maid at the charitable institute, Hailing House, but Flora is content with her job as assistant to the Isle of Dogs’ kindly Doctor Tapper. Taking a vow, they pledge to always be there for each other, come what may. Little do they know that the conflict will not be over by Christmas as supposed by the government and each one of the three friends are drawn terrifyingly into the turmoil of war. TOGETHER FOR CHRISTMAS can be purchased at Amazon and most online stores, supermarkets and bookshops. Although this piece of land has been not used for residential living since the 1930s, before then it was the location of a small population of around 300 people for over a century. 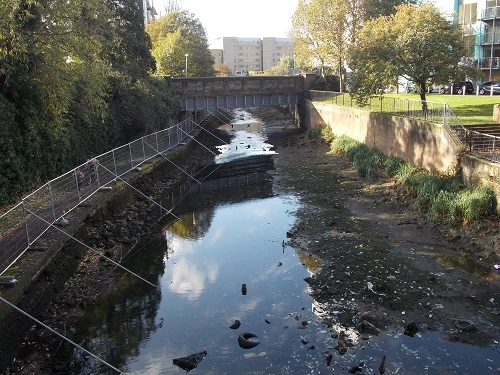 Because of its location it is effectively cut off by water, surrounded by Bow Creek and the Thames with just a narrow path going to Leamouth Road. 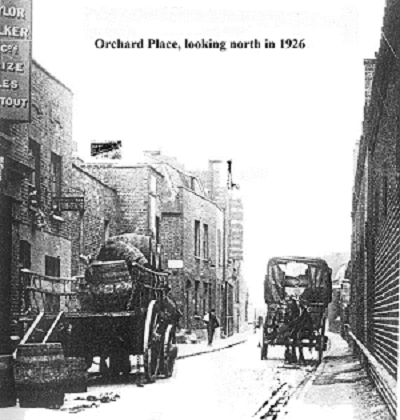 Many people in Poplar and the Isle of Dogs did not even know Orchard Place existed and those that did probably heard stories about the residents lawlessness and rough lifestyle. 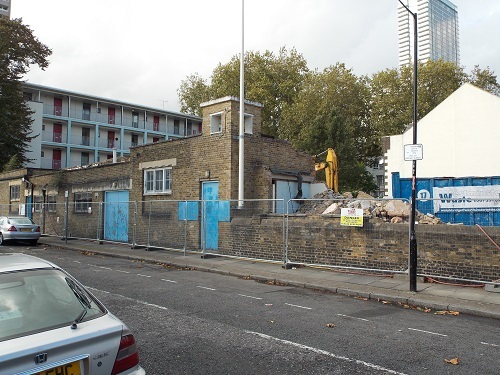 Many of the residents were related and worked in the various factories and shipyards, however the Thames Plate Glass Works was a major employer in the 19th century when it was estimated that 75% of the Orchard Place adult residents worked there. 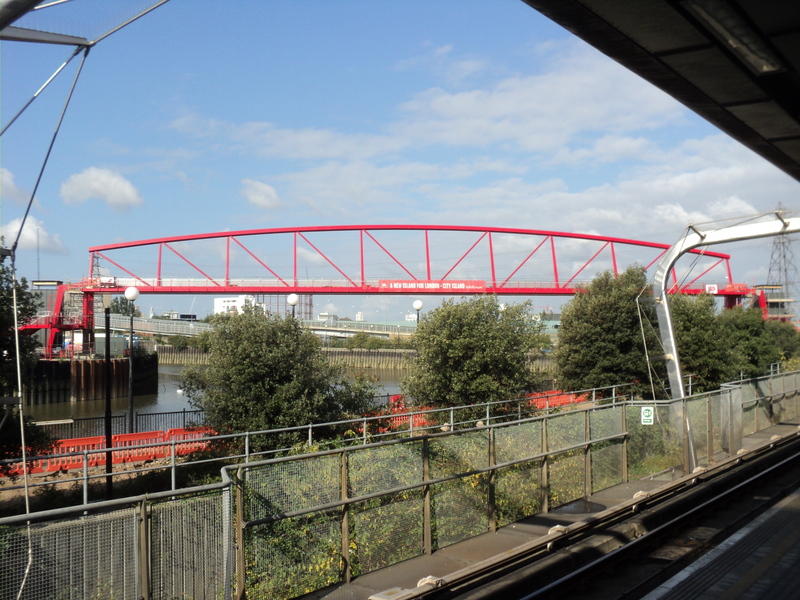 Eventually the residents were rehoused in nearby Oban House in Poplar and the houses demolished and land used for various industrial use. 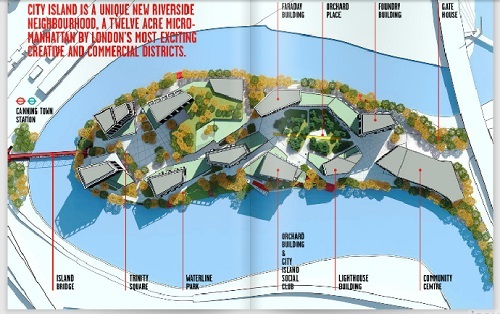 And that is the way it has been until a few years ago, when the land was cleared for development, various schemes were suggested but it seems the City Island development is now in the process of being started. 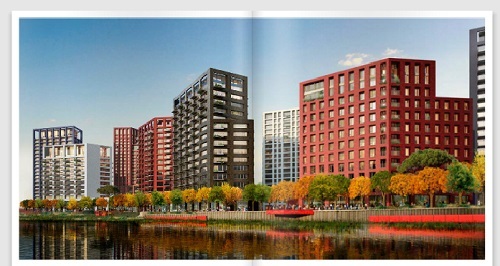 Reading about the development, there is no clear idea of how many people will live there, but they do stress that Orchard Place or City Island as it will be known will have a ‘community feel’ to it with gardens and leisure facilities. 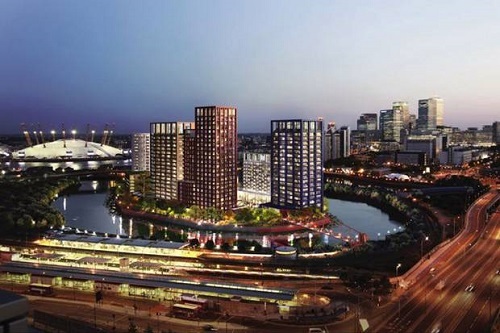 If the development goes ahead as planned it will be a remarkable transformation for a small piece of land that was considered London’s lost village , cut off from the nearby Isle of Dogs and Poplar but now in the City Island brochure, the main selling point is how well-connected it is ! 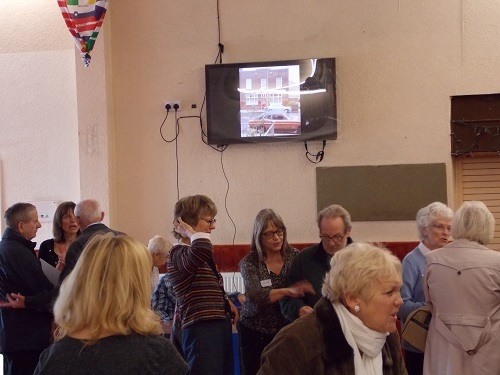 On Saturday, we were fortunate to attend the first Open Day of the Friends of the Island History Trust. The new group succeeds the Island History Trust project which was responsible for collecting photographs, ephemera and relevant historical information about the Island. The Island History Trust under the stewardship of Eve Hostettler was a charitable trust created in the 1980s to promote interest in the history of the Island and of the people and places within the Island. 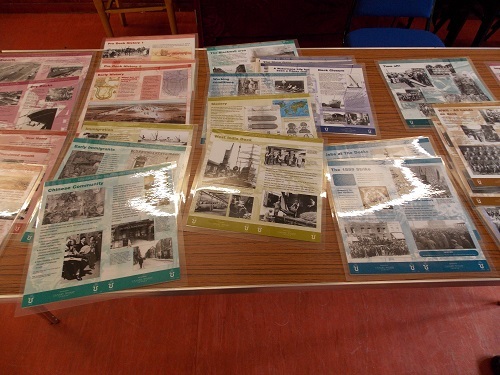 Some of the most popular events of the Island History Trust were the Open Days when visitors and Islanders came together to look at and discuss the many hundreds of photographs and documents. 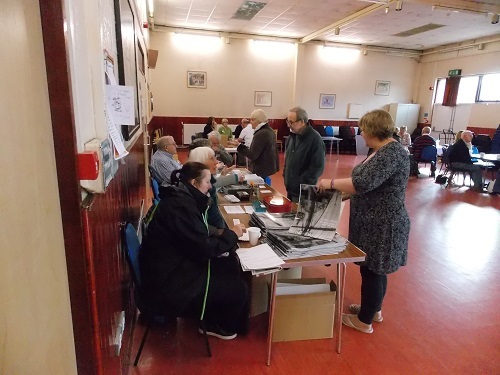 The new Friends of the Island History Trust have decided to follow that tradition and a wide range of people visited the first Open Day at St John’s Community Centre. Although a number of the original Trusts collections have been transferred to Tower Hamlets Local History Library and Archives, many have been transferred into digital form and been put onto the internet. The new group are hoping to expand this area, using the new technologies to give access to the latest photographs and information to interested people both in the UK and from all over world. Listening and talking to many of the people at the Open Day shows there is a growing interest in Local History and many older people especially understand the importance of remembering and recording the past for future generations. 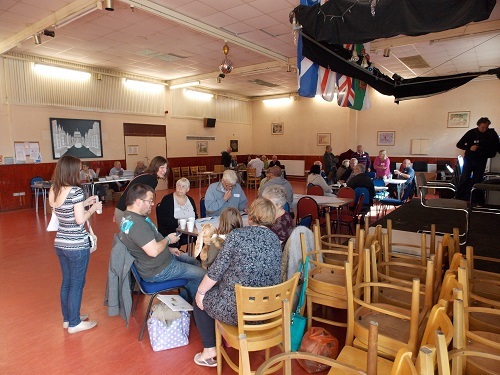 An important focus for the new group will be getting new Islanders and young people involved and celebrating their part in the story of the Isle of Dogs. The Friends of Island History Trust will play an important part in providing a central hub in which people who want information about the Island will have access to a number of knowledgeable local people. 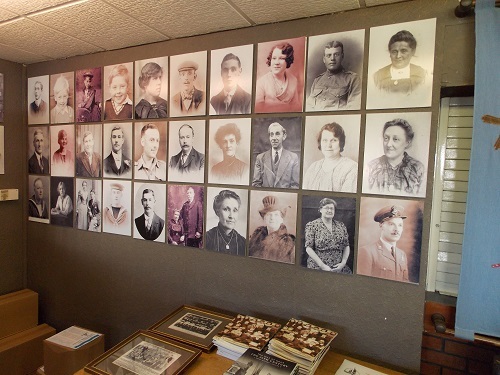 The group have a history room in St John’s that has a number of old photographs, books and other information, at present it is only open once a week manned by local volunteers. Other initiatives are a production of a calendar full of old photographs of the Island and a membership scheme where you can be a member of the Friends of Island History Trust and receive regular newsletters. 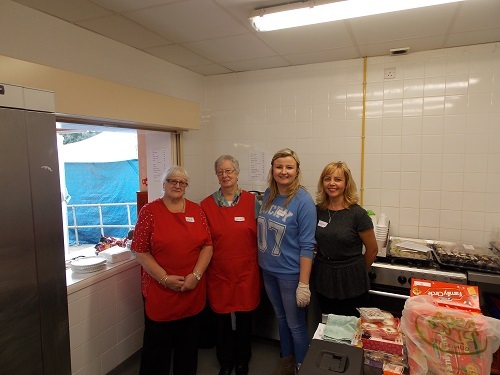 In many areas , local history is kept alive by the often unsung work of volunteers who come together for their love of their area. We are sure, the new Friends of Island History Trust will be a great success and an invaluable resource for the Island. 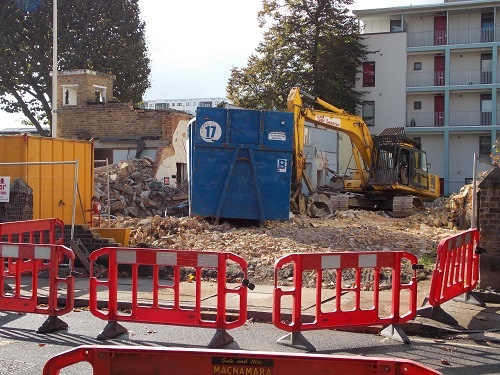 Buildings being demolished is not an unusual site on the Isle of Dogs, however walking down Alpha Grove I was surprised by the sight of a demolition squad knocking down the remains of St Luke’s Church Millwall. 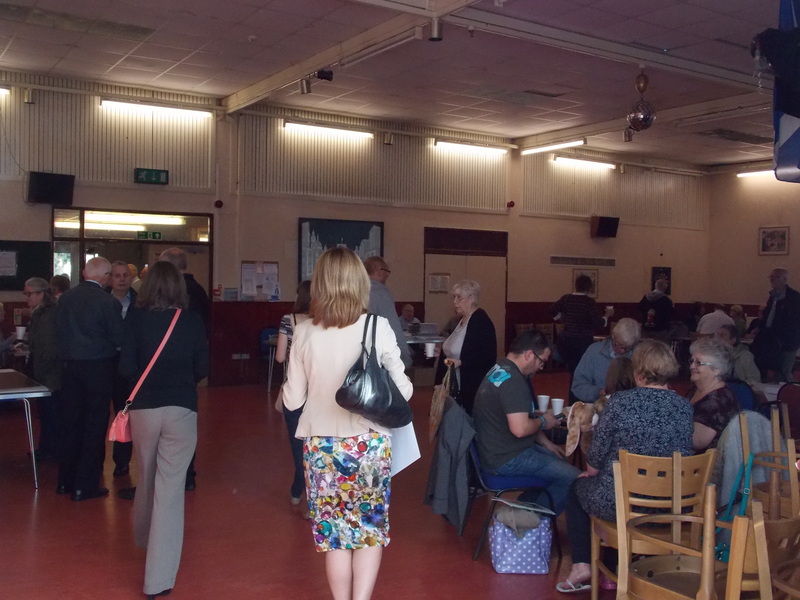 The building had become very run down in recent years and plans are in hand for a new church and community centre on the site. When this church is built it will carry on the tradition of church buildings on the site since 1868. The first church was built in 1868 on land donated by Lady Margaret Charteris and Lord Stafford, it was considered quite a grand church for the area seating 700. The architect was E. L. Blackburne who had earlier restored Crosby Hall in Bishopsgate. A mission hall was built on to the south side of the church in 1883. It was converted into a chapel when new parish rooms were built in 1912. There was also a Gothic-style vicarage built on the site in 1873. The church became an important part of the local community and as the following 1937 newspaper report states the scene of an occasional drama. Pretty 25-year-old Gladys Kite, dressmaker, of Havannah street, Millwall, sobbed as she told how for the third time her marriage had been postponed. She was to have married Mr Ernest Jolly, aged 22, of Wanlip-road, West Ham under-manager in a Dagenham refrigerator factory. Then Ernest fell out of work, so waited until to-day. “We had rented a flat at Ilford and had been paying for it for five weeks. We had been friends for eight years. For two hours she waited for him at her home, dressed in a bridal gown and carrying a bouquet of white lilies,her blonde hair specially waved, she waited to hand him the ring before she left for St, Luke’s Church. “My uncle Stephen arrived at 1.5o p.m., “and told me Ernest had disappeared,” she added. “We waited two hours before some one went round to the church to tell the guests there would be no wedding. “Ernest had been living with my parents for the” last month.” but it was arranged that he should spend last night with my uncle. 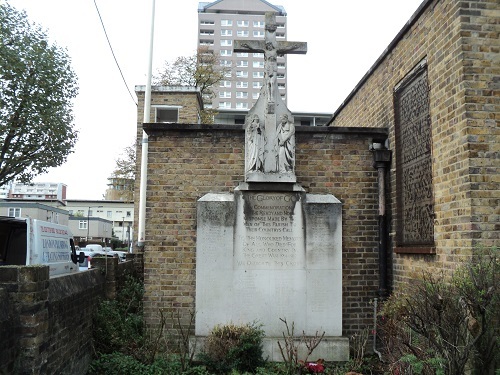 It was not to be third time lucky for poor Gladys , and within a few years the church itself was unlucky when it was badly damaged in the Second World War. 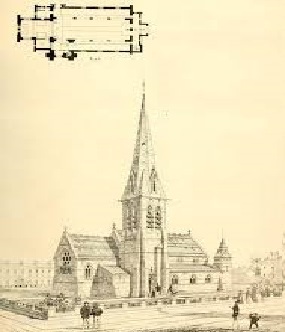 By 1960 the decision was made to demolish the church, however a chapel with stained-glass windows was made at the east end of the parish rooms and consecrated for worship. 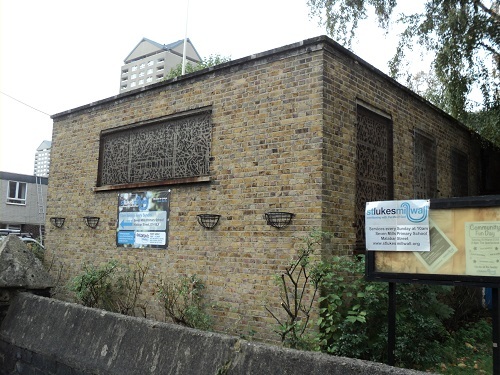 This chapel and the parish rooms was only ever intended to be a temporary solution but was used for the next 54 years. 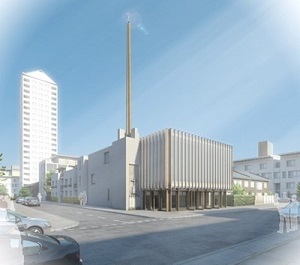 The design for the new church with community centre are in keeping with the church at the centre of the local community, however the destruction of the last remnant of the old church will be viewed with some sadness by a few islanders as a loss of a connection with the past.